Runners wanting to experience the stunning new routes for the Cape Town Marathon and Cape Town 10km, which include parts of the popular Fan Walk, have just 5 days left to enter before the 5pm deadline on Monday 9 September. The events on Sunday 22 September 2013 will follow new routes after the Race Organisers were advised to make changes owing to the construction of a MyCiti Bus terminus in Adderley Street, which traditionally hosts the start. 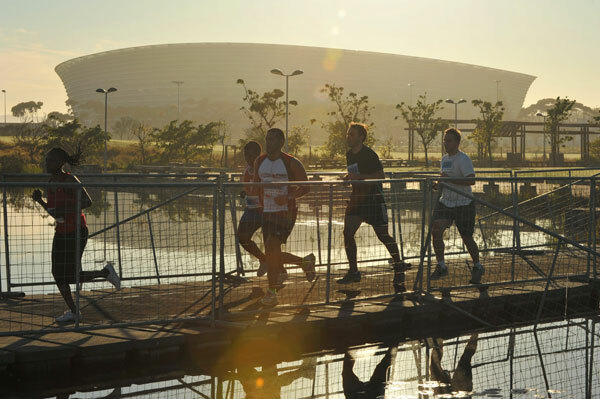 The 42.2km and 10km races now start and finish on the Cape Town Stadium’s Forecourt. Event organisers are excited about the start and finish venue being in the same place and see it as a huge positive for the race in that the Cape Town Stadium Forecourt is central and highly accessible to runners and spectators alike. Not only is the Forecourt a central location; there is also ample parking and accessibility to close by amenities. The Forecourt start and finish brings a slight change to the route, with 42.2km runners exiting Green Point down Somerset Road and along the Fan Walk and the 10km runners doing a loop through the V&A Waterfront. The Marathon will continue on through the CBD, towards the Southern Suburbs, looping around Rondebosch Common before redirecting runners back via Observatory and Pinelands to the City Bowl. The routes reunite along the Fan Walk and take participants along Beach Road, past the Mouille Point Lighthouse, through the Green Point Urban Park to the finish. The Cape Town Marathon is encouraging runners to join supporting family and friends and relax at the picturesque Forecourt once they have completed their race. Entertainment, as well as food and refreshments will be available for purchase. The City of Cape Town’s Come and Play programme will also be available to keep children entertained. Beat the looming entry deadline and enter the Cape Town Marathon or Cape Town 10km at www.capetownmarathon.com. Race packs can be collected at Registration; which takes place at the Cape Town Stadium in the ‘Player’s Mixing Zone’, Fritz Sonnenberg Road, Green Point on Friday, 20 September from10:00 – 19:00 and on Saturday, 21 September from 10:00 – 17:00. Here runners must present proof of entry or identification in order to receive their race numbers, timing chip, t-shirts for those runners who purchased them on entry, and all relevant race information.